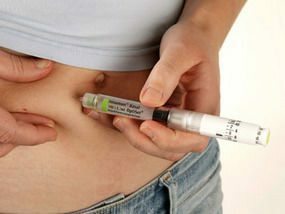 Insulin is NOT the ultimate “CURE”that everyone thinks it is…READ ON! Insulin is not the “answer” to type 2 diabetes because insulin causes inflammation, which is not good if you are a diabetic. When you inject insulin, you are basically injecting yourself with inflammation which is a HUGE risk factor for stroke and heart attack! By injecting yourself with insulin, you are causing a surge of a cytokine IL-6. IL-6 isalso inflammatory! There are other things that cause inflammation in your body such as high cortisol levels, Hormonal Imbalances, Gastrointestinal inflammation, Parasites, H.Plori Infections, Sugar, Food Sensitivities. Cortisol is produced by your adrenal glands and you need to be checked by a doctor who does thorough testing. Certain foods can cause inflammation as well, such as a diet high in refined sugar, salt, and fat: basically, the standard American diet of junk food. This is why it is vital that if you are taking insulin, you must eat a healthy diet high in vegetables, lean meat, fish, and nut and seeds. Notice that I didn’t mention fruits. If you are diabetic, you will want to consume “stone” fruits or fruits that contain a pit because they are lower on the glycemic index. There are certain markers in the blood that we can check to find out how much inflammation you have in your system. Those markers are C-RP or C-reactive protein and Homocysteine. The latest research on homocysteine and cognitive aging, Alzheimer’s, loss of brain function, and dementia reveal that a homocysteine level higher than 7 is linked to ACCELERATED BRAIN AGING. Homocysteine is a marker for inflammation directly linked to brain atrophy (wasting away). This is why Type 2 Diabetes causes brain problems. Ferritn is also a marker for inflammation so if your ferritin levels are high, the inflammation in your body is high! Just remember, inflammation is the ENEMY of the diabetic and you need a doctor who works as a detective to eliminate as much of it from your system as possible! To learn more about our Diabetes Recovery Program offered at The Naperville Institute For NeuroMetabolic Program click here.